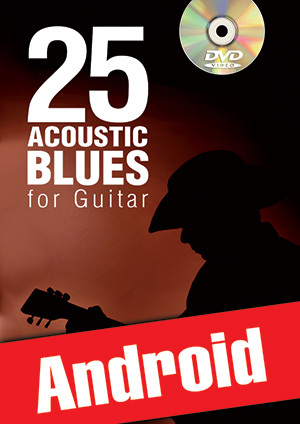 25 Acoustic Blues for Guitar (Android) (GUITAR, Courses for Android, Michael Bratton). By means of very extensive lessons this coursebook will most certainly satisfy your blues craving – and this without ever damping your pleasure of playing! The lessons you are taught here revolve around 25 fingerstyle acoustic blues pieces performed in the style of illustrious acoustic blues guitar players such as Robert Johnson, Big Bill Bronzy, Lonnie Johnson, Blind Blake, Mississippi John Hurt, Skip James, Lightnin’ Hopkins and many more. Each and every musical piece comprised within this coursebook covers two whole pages, meaning that you’re not dealing with mere blues chord progressions but with regular blues compositions. Aside from the pleasure of playing they provide, they afford you the opportunity to master the whole box of tricks that make up the peculiarity of this musical style. See? It’s all about learning by playing! The approach to be followed for the interpretation of these 25 musical pieces is illustrated in detail within the two preliminary chapters of this coursebook: plucking and fretting techniques and rhythms specific to acoustic blues are accurately and meticulously explained to you. In addition to this, the DVD shows you all 25 musical pieces at their full length and at two different tempi: first, for demonstration purposes, recorded at actual playing speed, then at a slower speed, in order to give you the opportunity to practice and overcome the upcoming difficulties. Since you are dealing here with the Android version of the tutorial, the book and the DVD have been replaced by a tablet-optimized multimedia pack containing musical sheets, texts and videos.